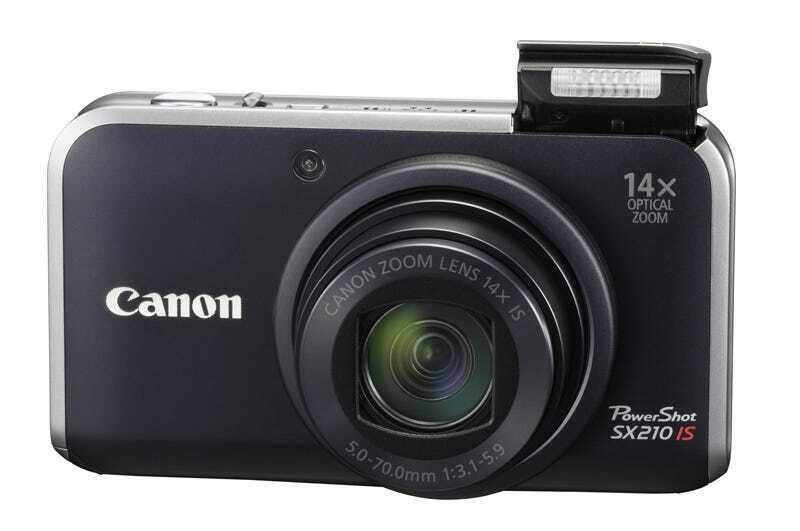 The SX210 is the standout of Canon's four new PowerShots point-and-shoots, shooting 14MP stills and 720p video (with stereo sound and optical zoom while shooting), with a crazy long 14x 28mm wide-angle zoom lens for $350. The SD3500 is their touch camera, also 14MP and 720p, but it's got a 5x 24mm wide-angle lens, and it's strikingly devoid of buttonage, because it's entirely touch-based, unlike their last, kinda awkward touchcam. Like the SX210, Canon's stressing its compatibility with Eye-Fi wireless SD cards. It's $330. And then you've got the SD1400 and SD1300, their tiniest point-and-shoots. The $250 SD1400, surprise, also 14MP and 720p video, but with a 4x zoom lens, while the cheaper SD1300 shoots 12MP and sadly, no 720p video for $200. I'm a little skeptical of 14 megapixels crammed into such tiny cameras—I especially wanna compare the higher-end SX210 to the S90, since I know the kind of pictures 50 extra bucks will get you. But we'll see. LAKE SUCCESS, N.Y., February 8, 2010 – Canon U.S.A., Inc., a leader in digital imaging, today announced the addition of four new PowerShot Digital cameras, the PowerShot SX210 IS, PowerShot SD3500 IS, PowerShot SD1400 IS and PowerShot SD1300 IS, offering today's photographer a compelling blend of cutting-edge photo capture technology and superior styling. The new PowerShot cameras offer increased shooting flexibility in a number of settings through advancements to the Smart Auto mode while offering greater photo personalization and enhanced creativity with new Scene Modes and Image effects. The addition of Fish-eye and Miniature Effect modes help photographers add a creative element or lend a humorous look and feel when capturing images of their favorite household pet or landscape scene. For more information about the new Canon PowerShot cameras, go to www.usa.canon.com/powershot.